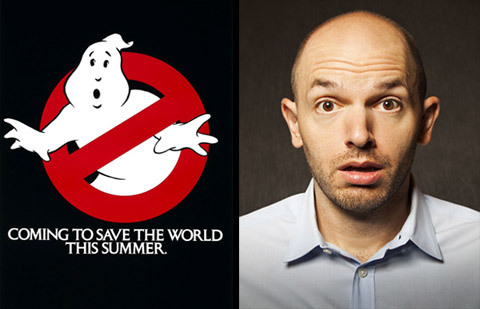 Paul Scheer does Ghostbusters at the Wayne Federman Int’l Film fest at Cinefamily. Forget that crazy hail. We’re heading towards a gorgeous weekend. We don’t call it the Best Coast for nothing. He’s done time in high-profile films like 40 Year Old Virgin and has had a significant presence on shows like Curb Your Enthusiasm. Four years ago, he started the Wayne Federman Int’l Film Festival at Cinefamily and never looked back. Except that time someone in the rear of the theater forgot to turn off their phone. Starting tonight with Sascha Baron Cohen and the hilariously inappropriate Klown, comedians choose, introduce, and riff on movies that influenced them. Subsequent pairings include Doug Benson and Breakfast at Tiffany’s, Paul Scheer and Ghostbusters, Chris Hardwick and Fletch, Will Forte and MacGruber, Lauren Lapkus and Big, and Kumail Nanjiani and The Descent. Surprise special guests are a given at this insiders’ laff fest. There will be post-screening Q&A’s for your burning questions so now’s your chance to ask Forte about the MacGruber sequel. Hopefully, he’ll demonstrate the SPFX with a matchstick and a paperclip. Fingers crossed for the mullet. THE WAYNE FEDERMAN INT’L FILM FEST — Thurs, March 5 – Sun, March 8; various times. $14/FREE for Cinefamily members — The Cinefamily, 611 N Fairfax, LA 90036. For tix and more info, go HERE. Art. Derby girls. What can go wrong? Eats, Beats, and Art for Wheels. Part benefit. Part art party. Part costume bash. Eat Your Art Out 8: Next Stop – The Twilight Zone is all of the above and more. The theme from the classic/creepy anthology T.V. series offers plenty of dress-up inspiration for the eighth year of this all-ages-extravaganza benefiting the Angel City Derby Girls: a skater-owned-and-operated flat track roller derby league currently ranked as one of the top ten in the world. Ms. Go Go’s “Talky Tina” wind-up-doll frock and killer roller skates are standing by. Taking over Titmouse Animation Studios in the heart of Hollywood, the night ‘o fun offers art for sale, DJ’s for dancing, food trucks for the famished, and drinks for everyone except the kiddos. Dave Pressler, Jim Mahfood, Mike Huddleston, Dave Crosland, and Yelley are among the 100+ artists donating for the cause. Ms. Go Go has dibs on any portraits of the gremlin-on-the-jet-wing. EAT YOUR ART OUT 8: NEXT STOP – THE TWILIGHT ZONE — Sat, March 7, 7pm. $5/all ages — Titmouse Animation Studios, 1121 Seward St, Hollywood 90038. For more info, go HERE. Ms. Go Go presents a Public Service Announcement: Sunday, March 8 is Daylight Saving Time. You may lose an hour of sleep but you won’t regret it after attending Spring Forward: a delicious afternoon of food, wine and music in Elysian Valley to benefit non-profit org Clockshop and support their public arts efforts along the L.A. River. In addition to music by DJ Adam Villacin, wine by Amy Atwood Selections, and fab food from semi-secret dine-spot and host/collaborator elysian, there will be optional tours of Clockshop’s current endeavor: the Bowtie Project, located along the L.A. River in Northeast Los Angeles. Present and future collaborators such as artists Rafa Esparza and Rosten Woo and landscape urbanists Mia Lehrer + Associates will lead guests on mini-excursions to view collaborative efforts to transform the 19-acre post-industrial spot, which has been closed to the public for over a decade. Go Go’ers, you can always make up that lost shut-eye with a nap. SPRING FORWARD – Sun, March 8, 3-6pm. $100 — Clockshop, 2806 Clearwater St, LA 90039. For tix and more info, go HERE. More Weekend Go Go Fun!